For the first time in history the dosing gun is now digital and self-powered. Just like a cordless drill, a battery pack set in a robust casing powers the plunger mechanism and with one simple touch of the button (as opposed to a hand pump on the handle) an accurate, fully calibrated dose is delivered to the animal. Just set the dosage on the digital keypad and after this is delivered the plunger shoots back with incredible speed to refill the chamber, ready to deliver the next dose. 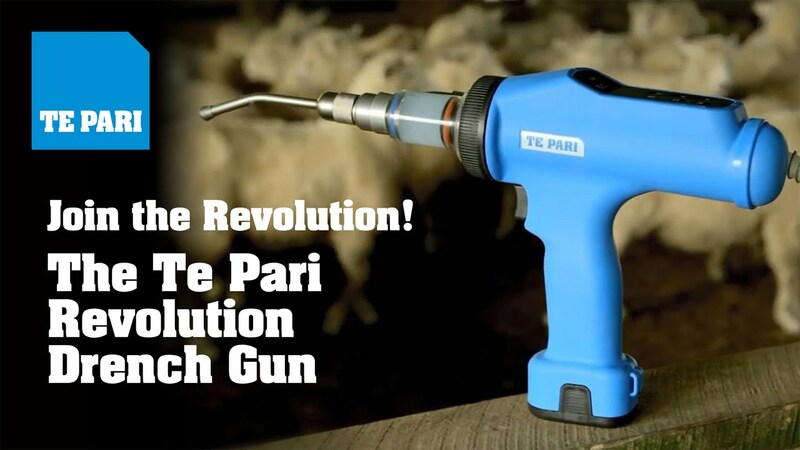 The speed and ease of use means the Te Pari Revolution drench gun will drastically reduce hand stress, whilst delivering an accurate dosage super quick saving you time in the yards and the race. The world first battery powered, electronically calibrated Te Pari Revolution Dosing Gun will make light work of you drenching, pour on and injecting. Simply adjust the dosage rate on the digital screen and effortless pull the trigger to apply any dose. Use as a standalone powered doser or connect it to the Te Pari Scale System for auto calibration. Don’t put up with pumping your hand any longer! This standard unit can be upgraded to the Smart model at a later date to form part of an integrated animal management system. The Te Pari Scale Indicator captures the weight from the loadbars and auto calculates the animal dose and transmits it to the gun which then automatically adjusts the dosage. It provides exact control of expensive medicine, saving you money by cutting out waste through overdosing and reducing remedy resistance caused by under dosing. This vital animal health information along with weight records can then be downloaded to your phone and emailed back to your office for further analysis and recording. Please complete the form below, click SUBMIT and then download your information. Anything else we can help you with? The Te Pari Dosing Gun has an interchangeable barrel which means you can fit either a 70ml barrel for drenching or dosing, a 14ml for injecting and vaccinating or even a 6ml for administering smaller doses to or higher concentrated doses as required. The same body can be used for a variety of functions. You can purchase the injection barrel assembly if you already own a Dosing Gun and change back and forth as needed. Are you after a price, spare parts, a demo on your farm or simply some advice? Please give us a call or click contact us and one of our sales people will be in touch. The mark Te Pari™, is a registered trade mark licensed or owned by Te Pari Products Limited in New Zealand and other countries.